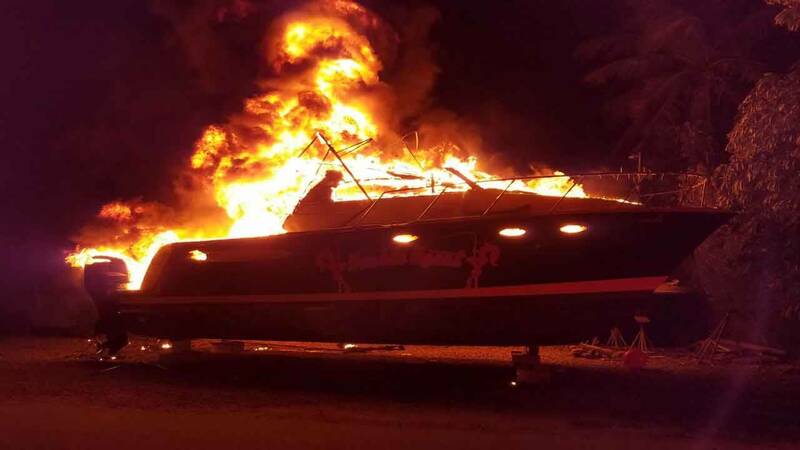 Authorities are investigating a suspicious boat fire at the Coral Bay Marina in Islamorada. 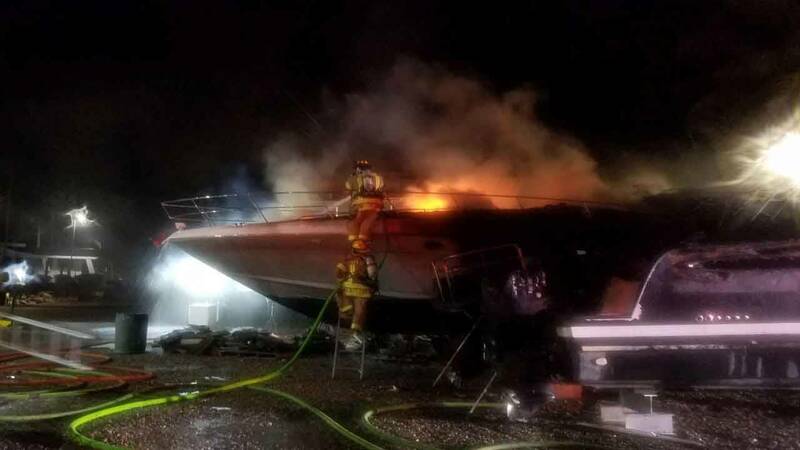 ISLAMORADA, Fla. - The Monroe County Sheriff's Office is investigating a suspicious fire that destroyed two boats, damaged another and seriously injured a man early Monday in the Florida Keys. Sheriff's spokesman Adam Linhardt said firefighters and deputies were called to the Coral Bay Marina in Islamorada about 12:45 a.m. When they arrived, they found two boats fully engulfed in flames and another catching fire. Linhardt said one man called 911 hours later to say he had been involved in an accident with a boat at the marina and was currently at Jackson Memorial Hospital in Miami. A witness told deputies he heard several loud explosions and looked out his window to see a man on fire, running away from the marina toward a pickup truck. The state fire marshal is investigating a suspicious fire that burned three boats and injured a man at the Coral Bay Marina in Islamorada. Another witness said she heard a loud noise, looked outside and saw three men standing near the truck, one of them holding a "fire stick." That witness said she saw the man throw the stick into an already-burning boat before leaving in the truck. A third witness reported talking to two men who claimed to be working on a boat that was having electrical issues. The boat caught fire moments thereafter. No arrests have been made, but the state fire marshal is investigating.